On November 16, a lady named Renuka Jain tweeted this (below) in some anger. In the short space afforded on Twitter for a bio, Jain informs the world she is a chartered accountant, company secretary, financial and tax advisor and portfolio manager, professionally, while her hobbies include sky diving in Munich and “bungy” in New Zealand. You’d think a woman with such a full life would have not a snip of time to waste, but Jain, propelled by a love for her country, or more likely a burning sense of caste injustice, managed to trawl the internet until she arrived at the Facebook page of one Tina Dabi. Dabi hit the headlines in May this year for topping the Union Public Service Commission exam, which is the principal measure used in deciding each year’s entrants into India’s different civil services. Dabi’s case was headline-worthy because of her caste—she is Dalit. 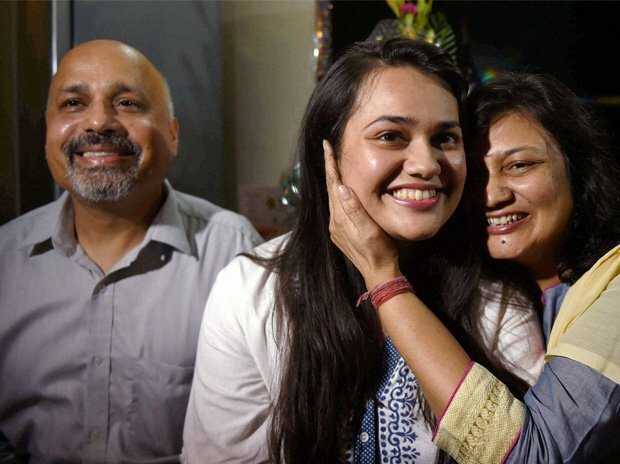 In almost 70 years of independence, when caste was ostensibly abolished in India, she is the first Dalit to top the exam. Renuka Jain’s tweet demonstrated some essential aspects of how Hindutva – an ideology premised on caste hierarchy – encounters lower-caste political assertion (such as the demand for reservations in government jobs, education, positions of political authority). Within hours her complaint had been retweeted over 220 times. Reading her tweet and some of the more enthusiastic responses, different channels of anger could be isolated. Many were angry that Dabi was rich enough to go on holiday in Amsterdam. As the original tweet claimed, the Dalit girl who sneakily knocked out a deserving boy used caste-based reservations when here is evidence that she is from the “creamy layer”. The high-caste boy’s merit is taken for granted, just as Jain’s merit is in acquiring not one or two but four jobs, and travelling to New Zealand to bungy-jump, and Munich to sky-dive. In the Twitter horde’s understanding, Dabi deserved this kind of public humiliation because she has the money to visit Amsterdam. The “creamy layer” argument is as old as caste-based-reservations itself: the prevailing belief amongst upper-castes that jobs and opportunities are being snaffled up by some hitherto-unnoticed privileged class amongst the lowest-castes, thus denying the benefits of reservations to the genuinely needy, and thus making reservations – by any measure, a mild form of redress for the historical injustices perpetrated – a failed policy. The simple answer to this argument is that Dabi did not actually use the reservations available to her, but topped the exam overall. Jain’s horrifying tweet gets even that wrong—perhaps intentionally. But the creamy layer argument is fallacious in another sense. It supposes that the only injustice attached to caste is economic. It blindly discounts the lived experience of Dalits and Scheduled Castes and Tribes in India. Even those born into relative wealth have to face – from friends, colleagues, school and college mates – discrimination, innuendo, denial of rights, the smug superiority of those who have sat at the top of the pyramid for thousands of years. They fight a tide of upper-caste opinion that suggests that, even after besting all these measures of achievement, they are in the position through some venality, some perversion of the system. They are wrongly accused of infractions. Just see what they did to Dabi. Say Dabi had used reservations to reach where she has. She would have done nothing wrong. Yet she would be treated as if she had, as a cheat. As a society, we need to be clear about this. No one who uses reservations is committing a crime. This is a method of correcting three millennia of a deeply shameful part of our history, a society-wide form of injustice that has shaped economic and educational privilege throughout Indian history, and that continues in many, many forms today. The enormity of Dabi’s achievement is she did not use reservations when they were available to her. If you are climbing a tower and someone has a tiny stepladder to start you off, most would happily use it. In my reading, Dabi refused because she could see the relative comforts and education she grew up with had granted her tools other Dalits would never receive in our system. She could see that she did not need the stepladder when other Dalit candidates might. The third identifiable channel of anger was in reference to the man she had her arm around in the photograph, Athar Amir Khan. Khan is clearly another high achiever, finishing second in the UPSC exam, and has also been recruited into the Rajasthan cadre—plenty of common ground, if any is needed at 23, for two young people to fall in love. Yet in even those tweets that were not explicitly offensive, you could sense the spitting rage of those offended by this interfaith couple. It suggested, at least to me, that in contemporary India we have placed one final burden on those who use reservations. In the original tweet and the responses to it you could sense a kind of proprietorship. These people were angry that Dabi had used reservations and then consorted with a Muslim. A Kashmiri Muslim at that. Of course, she had not used reservations, but that’s not the point. They seemed to be suggesting that those who did use reservations owed them something, owed India something. They do not. It is India – and all of us – who owe them.